I've read quite a few books in the Quilts of Love series, and I have enjoyed most of them. Each of the books features a quilt, many feature quilting, and they all have a love story. Beyond that, they can be pretty different. 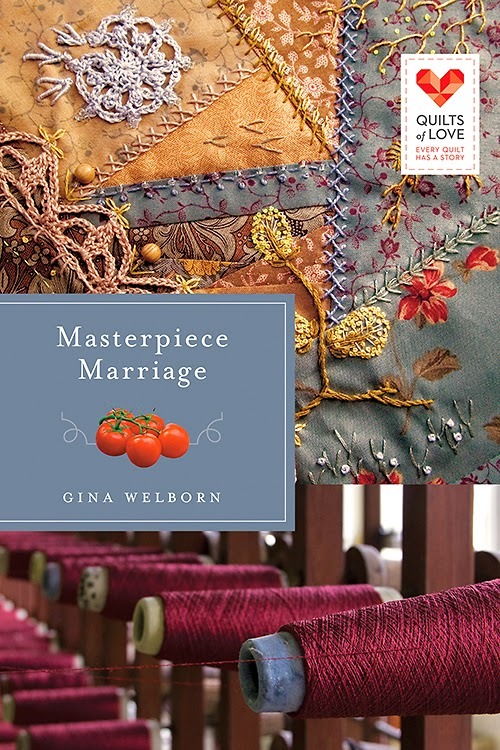 This one, Masterpiece Marriage, by Gina Welborn, is set around 1890, and while not exactly historical fiction, the historical setting and detail is quite good. She thinks studying the growth pattern of her tomato seedlings is more time-worthy than pursuing a mate. When she needs illustrations of her prized plants Mary turns to Priscilla Dane Osbourne for help. Zenus Dane also seeks help from his Aunt Priscilla. In order to salvage his flooded textile mill, he wnats to sell her hand-drawn quilt patterns alongside his repurposed fabric scraps. No quilter has national name recognition like his aunt, but Priscilla is fiercely protective of her patterns. Convincing her will not be easy. It seems Priscilla is the answer to both their prayers. But Priscilla would rather weave a masterpiece marriage for her nephew than save his flooded business. Trouble is, her plans don't include Mary, whose own growing attraction for Zenus could jeopardize Priscilla's goodwill toward her. If faced with a decision between love and ambition, will Mary be able to choose? I found the characters to be quite likable, particularly the main three: Zenus, Mary, and Aunt Priscilla. Mary is English, and has been all over the world, earning degrees and trying to become a professor. That is not an easy task for a woman at the time. Zenus worries about his employees, who are mostly single mothers, and he's also interested in finding a wife. He has his eye set on Arel Dewey, so his trip to get help from his aunt also gives him a chance with Arel. Priscilla is a wealthy widow, quite used to getting her way in everything. I wasn't quite sure what to make of her initially, but she really grew on me and is probably my favorite character in the book. Like most other titles in the Quilts of Love series, this is a pretty light and easy read. Perfect for a lazy Saturday. You can see what other LitFuse reviewers thought of the book too.